Could You Be a Ricker Rider? 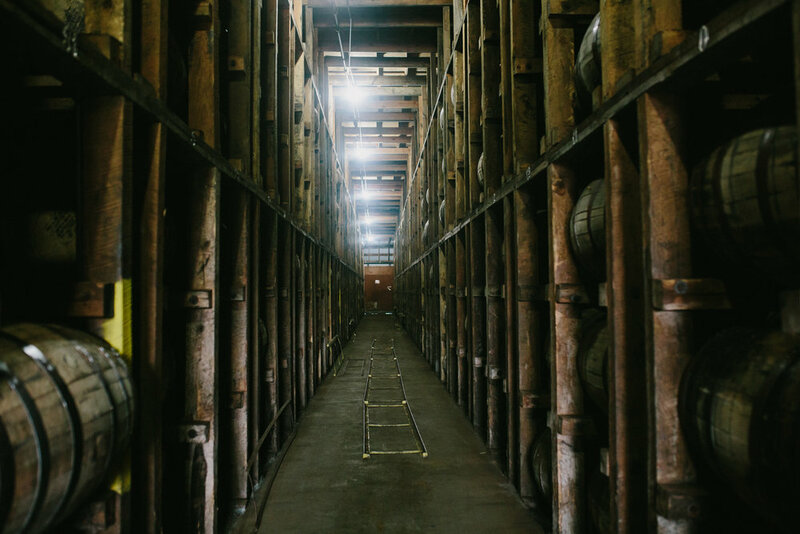 Ever been in a bourbon warehouse? Did you think about the person whose job it is to get each of those quarter-ton barrels perfectly in place, many stories in the air? Meet Keith Downs. Maybe you’ve been in a Kentucky warehouse where bourbon ages in huge barrels racked many stories high. But did you think about the person whose job it is to get each of those quarter-ton barrels perfectly in place? That person is called a ricker rider. Today, we take you to Four Roses Distillery to meet one of the best: Keith Downs. Nine a.m., and it’s hot already, the stickiness and humidity of a Kentucky July already creeping into the Four Roses bourbon aging and bottling facility in Cox’s Creek, Kentucky. 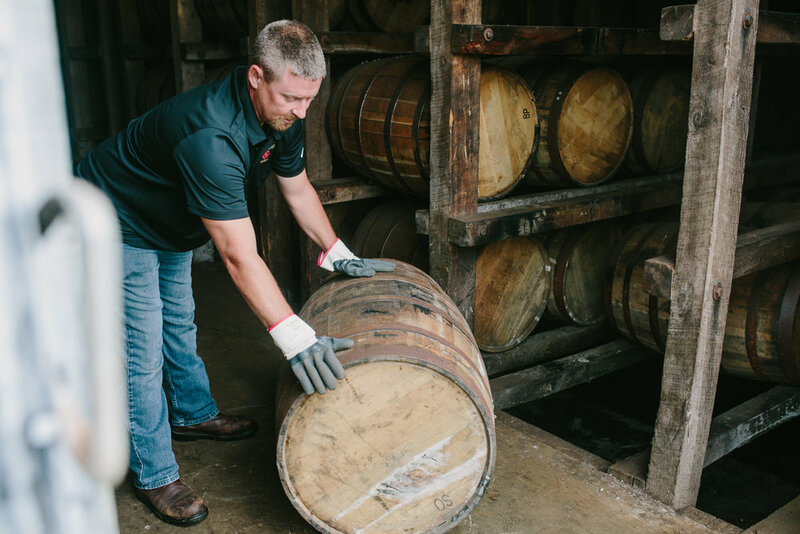 While the actual making of the distiller’s bourbon happens 50 miles away in Lawrenceburg, the real magic — the years the whiskey spends aging, interacting with the charred-oak barrels that are essential to bourbon becoming bourbon — happens here. We’re standing outside of one of the 20 storage warehouses — known as rickhouses or rackhouses — that Four Roses has on the property. Each one has the capacity to hold almost 12,000 53-gallon barrels. In other words, at any given time on this property, more than 12 million gallons of the South’s — and increasingly the world’s — most beloved whiskey are aging. Inside each rickhouse, there are 90 wooden racks, holding 22 barrels of aging bourbon in 636,000 gallons of divided between 90 rows, each row 22 barrels deep, stacked six rows high. (While some distilleries have racks many more stories high, producing a wide range of flavors from the same liquid due to variance in temperature, Four Roses remains one of the only bourbon distilleries to maintain single-level rickhouses). Some of their warehouses have rows that house 23 barrels per row, but the majority, according to Master Distiller Brent Elliott, have 22 in each. Upon opening the door, you’re greeted with the scents of bourbon — the oak and vanilla and sweet corn we all know and love — riding on the slight bluegrass breeze. It’s a wonder to see all this bourbon-in-progress, but these 500-pound barrels don’t just magically appear there, though. They have to get there somehow, and that’s where people like Keith Downs come in. Up until recently, Downs had worked for over a decade in the rickhouses as a “ricker rider.” His job: “clocking” the barrels. To “clock” a quarter-ton bourbon barrel, one must first spin it, so that its metal hoops align with the wooden rails along each row. Then, one most rotate it into precisely the right position before rolling it into the proper row. The end goal of clocking is to make sure that, no matter where in the row the barrel lands, the bung will be up, at high noon on a clock face — thus ensuring the bung remains in place throughout the years of aging period, keeping the nectar of life inside each barrel. Downs leans over a barrel in front of him, circling the head end of the barrel with a finger. With each row usually 22 barrels deep, that means there are 22 different positions that the ricker rider needs to know. A mistake in positioning means a leaky barrel. And nobody likes a leaky barrel. The job seems overwhelming. Being a ricker rider wasn’t what Downs had expected to do when he first started working at Four Roses. The older warehouses workers, though, told him to stick it out, even if he wasn’t sure it was the job for him. “I had it made before this. I was riding a forklift, and I didn’t sweat. I didn’t use any muscle,” he says with a laugh. That all changed in those first weeks working the ricks. Downs says it took him a few weeks to become confident in his clocking. He used — and new guys continue to use — what is simply a stick of wood with each of the clocks written down on it. It can be leaned against a nearby rick or hung on a nail where you can see it. The entire process happens fairly quickly, in the grand scheme of moving 500-pound barrels around both horizontally and vertically in a warehouse. When loading new barrels of bourbon into a warehouse, they come off the truck and down a metal track — like a miniature railroad — to the ricker rider. If they’re on the first floor, everything is fine: The ricker rider accepts the barrel and prepares to clock it and send it down the row. More often than not, the barrel won’t arrive to the ricker in the right position. This is where the craft of clocking comes in. When he sees a barrel coming at him, Downs says, he’s already guessing where the bung will be when it gets to him. “I’ll see how the barrel is rolling, and I’ll catch the barrel and spin it. We need to always make sure the money is on the catwalk side.” The “money” is the stamp with batch number and date on the head of each barrel. This isn’t as easy as it sounds, though. Thankfully, physics comes to the rescue. The barrel also needs to be rotated, which is accomplished, in part, by rocking it. He’s talking in clock terms again. On the first floor of the rickhouse, this all seems somewhat intuitive, easy even. Sure, each barrels weigh a quarter of a ton, but you’re on solid ground. There are, though, five other levels of barrels above the first. That’s where the actual “ricker” comes in — it’s the device that every “ricker rider” must ride. The ricker is a platform, 3 ½ feet square, that raises and lowers — a tiny, human-powered elevator. The ricker rider stands on it, catches the barrel, clocks it, and then rides the ricker up to the proper level before rolling it into the row. The ricker rider then comes back down and repeats the process. But remember this: He’s working with this 500-barrel while being lifted on a platform off the ground. If the barrel happened to tip or roll the wrong way, not only would there be a loss of bourbon, but the potential for serious injury below. Thankfully, Downs says, he’s only seen that happen once or twice over his entire career. A typical lot of barrels will contain 140-150 barrels. In a typical day, Downs said, he’d put away right around 300 barrels. Once a ricker rider has the barrel clocked to the right position, though, the job isn’t over yet. The next part is dangerous not only for the ricker rider, who has to worry about his own hands and fingers (you don’t have to have a 500-pound barrel roll over your toe to know it would hurt), but also those of the one or two other warehouse workers who are standing on catwalks along the row to guide the barrels to their ultimate destination. “The straighter we can get them in, the easier it’ll be to get them out. Looking down the row, I can see now that the barrels are going to want to hit his pole because of how it’s leaning. I can put the barrel in just so to miss that pole,” Downs said, pointing to a place on one of the poles where the wood had splintered. “You can see on the pole, it’s been chewed up where barrels have been hitting it,” he adds. Making sure it goes in right the first time isn’t only about the structural integrity of the warehouse or the barrels, though. “You want to take care of your guys in the rick; you don’t want to make the job harder on them,” Downs says. How long does it take, though, to zero in on how to roll the barrel just so? The barrels don’t stay in the rickhouses forever, though. Eventually, they all need to come out. The exact same way they went in. 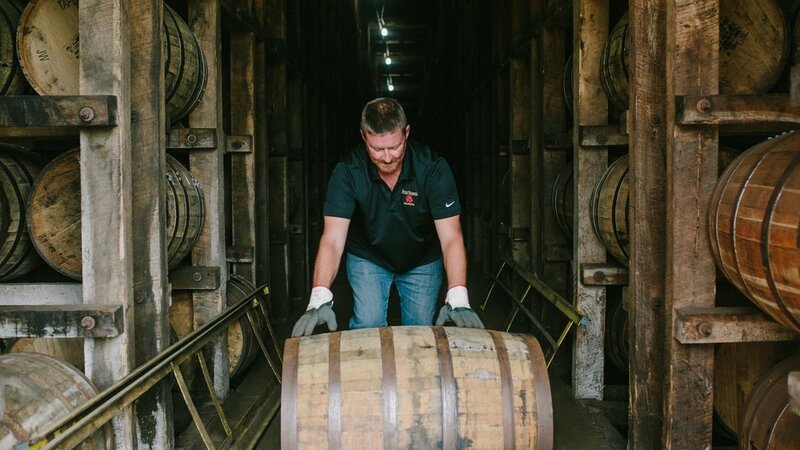 Once a barrel of bourbon has spent its allotted years in the aging process, the ricking process happens in reverse, with crew members on the catwalks rolling the barrels back to the ricker rider, who catches them, brings them down to the ground floor, and rolls them to the truck. If the crew is working a section of the rickhouse that is far from the door, there will be one or two people stationed along the track to help guide the barrel along. “Once we selected a [rick]house, we’ll take the dump load, and while we’re doing that, another crew will be putting away new barrels,” he says. It would seem that taking them out would be easier, as the “angel’s share” — a distiller’s term for the piece of the whiskey lost to evaporation — has made the barrel lighter and easier to work with. Right? Not for Downs. He prefers putting them in. “I guess I’m a little different,” he concludes. For this entire process, strength is involved, obviously, but muscles build over time. Muscle memory, too, can develop. But the most important asset to a ricker rider, according to Downs? A whole lot of common sense. “A 500-pound barrel is coming at you against something that won’t move [like another barrel or a structural element of the warehouse]. You don’t get in the way,” Downs says. Common sense, he says, comes from trial and error, from learning over time. Second to common sense, Downs says, is communication. Once the barrels are unloaded, they once again need to be clocked, this time on the “dump floor.” A dump floor is maybe the most beautifully pungent place in any bourbon-making operation — where you can smell hundreds of gallons of whiskey being exposed to fresh air all at once. The person in charge of dumping has to line up 10 barrels in a row, just so, and then drill out the bungs, put vent tubes in, and turn them 180 degrees upside down, so they all dump as the same time. There are games, too, where glory can be won for one’s distillery. When the Kentucky Bourbon Festival takes in Bardstown every fall, distilleries compete in both individual and team barrel-roll competitions. Competitors have to roll 10 bourbon barrels around a course and are scored on time and have points deducted for every bung that doesn’t clock in precisely at noon noon. Downs says a Four Roses competitor, Heaven Hill, typically dominates the event. Downs no longer competes at festival time, but he used to. It was a great experience for him, but he says he’s much more comfortable in the rickhouse. Downs pauses for a few seconds, then comes out with it.